This term is often used in real estate to suggest that property location is the cause for value based on where the property is located. In the wine world the same also applies as certain locations are the home to valuable and most often famous vineyards. These plots of land are recognized as grand cru or other other designations and their fruit produces wines with certain quality. Though out Europe the wines are identified by their region and or vineyard name. Most of the wines in this area are expensive and deserve the price due to their outstanding quality and history of production. Locations wines are all bottled at a facility outside the city limits of Barcelona. This allows for the control of quality and shipping. You will notice that all of the above wines are bottled in the same shape bottle, which is not cheap. The corks used are of the highest quality and the glass is superior to most of that which is used in Europe. The winery cuts no corners when it comes to production and export. 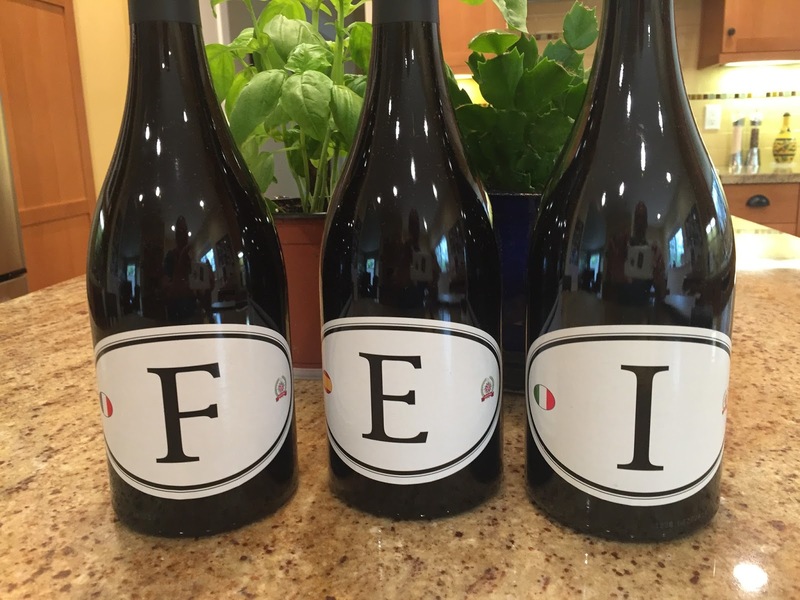 F for France is just a superb bottle of wine made from a blend of Grenache, Syrah and mixed Bordeaux varietals. The origin of the fruit is from the Rhone, Roussillon, Maury and Bordeaux regions of France. It checks in at a healthy 15% ABV, but is not hot or course at all. Very aromatic and integrated tannins make this a joy to drink anytime. Aged 10 months in oak prior to bottling. In my opinion this wine far exceeds the majority of wines from each of the above regions which retail in same price range. The generous fruit and complex flavors that you get do not appear at the lower levels of each region. The blend is better than the single part. E for Spain is an example of the quest for fruit from many different regions of the country. The blend of Grenache, Tempranillo, Monastrell and Carignan is sourced from the following regions: Priorat, Jumilla, Toro, Rioja and Ribera del Duero. Quite rich with berries, plum and cherry this is a mouthful of medium full fruit and a lavish finish. With an ABV of 14.5 this is a ripe and round wine. Quite simply put this is delicious ... Again this has more weight and body than the average young Spanish Tempranillo. This bottling has the capacity to age for a while and gain more complexity. I for Italy. David found the base vineyards to make this lovely wine with the following varietals: Puglia provided Negroamaro and Nero d'Avola and that was blended with Barbara from the Asti region of Piemonte. David feels this wine with its solid core of acidity and can age for a number of years to gain more complexity. It checks in at 14.5% ABV and again is all about fruit. There is more of an earthy and tar like quality which is in the background. You could compare this wine with the name most people know, Chianti and this is different with much more obvious fruit flavors and more texture to the body. This would compliment any Italian dish and make the meal a joy. * The Locations wines were provided by Balzac Communications which also linked writers to an interactive video conference with David Phinney. So while it's true that the people make an event (and the people definitely made any event!) this space definitely adds a different dimension to it. Went to venue New York here for an evening event and I was really impressed. The wines speak for themselves and they are real good dollar values.